Gear Sport: How do I backup data stored on the Gear Sport? backed up data to the Gear Sport from your mobile device. (3) Back up and restore. 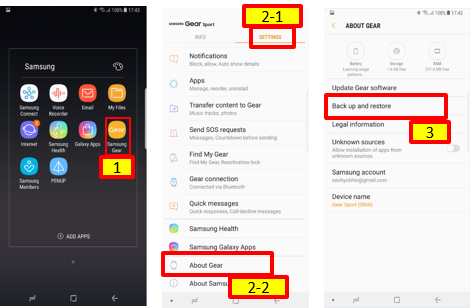 The Gear’s Settings data (Except Remote connection) will be backed up to the mobile device. If you previously backed up your Gear data, you can restore it to your Gear now. This may take some time depending on the size of the files. [Gear IconX] How to restart when it seemed to be not responding?